Gerald M. Oppenheimer and Ronald Bayer are the authors of Shattered Dreams? 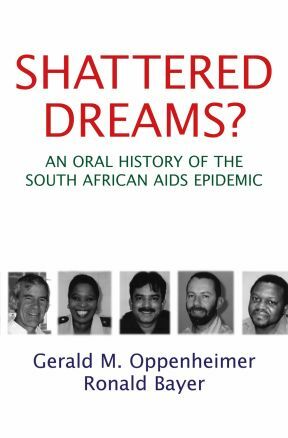 : An Oral History of the South African AIDS Epidemic which uses interviews to tell the story of how physicians and nurses in South Africa struggled to ride the tiger of the world’s most catastrophic AIDS epidemic. They wrote such a compelling piece for World AIDS Day that I thought it would be nice to delve deeper into their book. The excerpt below looks at how doctors responded to the AIDS epidemic in South Africa. In time, the dimensions of the South African AIDS epidemic would touch every element of the country’s health care system, although the vast majority of cases would fall most heavily on the public sector’s hospitals and clinics. But, at the outset, there were choices to be made about how invested individual doctors and nurses would become in caring for those with AIDS. Many did everything possible to avoid the new disease; others simply accepted the unfolding medical challenge and its demands. Very different were those who felt drawn to people sickened by HIV. The unusual clinical picture presented by their patients became a source of interest and fascination to some doctors. AIDS awakened a sense of scientific excitement, even as the misery of those who were sick underscored the limits of their capacity to intervene. James Muller, who began to serve as the head of the Department of Medicine or Pietermaritzburg’s three hospitals in 1994 when he was 45 years old, spoke of coming to grips with a new burden. Some things just get thrust upon you. There was no one else to do it. It was obviously going to become a major part of the practice of the department, so I thought I had to take responsibility for it. Also it was interesting. We were learning, learning as we went along. There were new problems to be solved, new clinical manifestations to be recognized; the best way is to respond to them. It was very unfortunate for the patient, but for the clinicians it was fascinating. Fascination could sustain the drive to understand the pattern of opportunistic infections in AIDS patients and to unravel the complexity of the diagnostic challenges posed by HIV. But it could not long serve to mask the suffering and the inevitability of death in those increasingly filling the medical wards. At King Edward VIII, Umesh Lalloo recalled the mix of professional excitement and clinical despair that would define his early engagement with the epidemic. You worked in the medical ward, and the number of cases was beginning to increase. It was a challenge to read about AIDS in the literature and begin to see these cases. It aroused your own interest, and we used to regularly present these patients. We had numerous clinical forums. It was the clinical challenge that first attracted me. Despite the clinical challenge of managing AIDS patients, a few doctors opposed the prevailing view that such cases demonstrated the futility of what medicine could offer under the conditions current in South Africa. Aware of strides that had already been made in treating opportunistic infections in Europe and the United States, they sought to apply these interventions to their own very sick patients. Leon Levin, born in 1963, was drawn to such prospects in his care for children in the years he worked at Johannesburg Hospital, in the mid-1990s. People had the attitude, ‘‘It’s only HIV; there’s nothing we can do. Just ignore it, and just give them Bactrim.’’ But I began to see that there was more to it than just these children with no [good] prognosis. I began to get a glimmer of hope; with good care, good nutrition, PCP prophylaxis, these children’s lives were improved. There was no question that I felt there was something to be done. I grew because the more I got involved, the more I saw what could be done; the more I saw, the more I did, even finding ingenious ways of doing it. It wasn’t all doom and gloom. I think that the stigma of HIV is what attracted me. The fact that there was clearly such a lack of understanding in our community of how a person gets HIV infected, and the profile of an infected person, and the fact that most people didn’t want to be involved without even getting to understand what’s going on, is what made me want to stay. I needed to do this for patients and for myself. Like Naidoo, Neil McKerrow, at Pietermaritzburg’s Edendale Hospital, felt touched by the suffering and stigma of those with AIDS. As a pediatrician, he had involved himself with children who had been sexually abused. Now, his interest was in the children who would be compelled to take on adult responsibilities as their mothers’ health failed, children who would ultimately be orphaned. Some of those children will be infected, so by default I became actively involved in caring for infected children. The other default was [that] no other pediatricians were willing to look at that issue. They found it a little too depressing. They found it very demotivating, demoralizing, and they also had a very fatalistic approach. So, they washed their hands of the infants. The powerful influence of religious commitment, so often at the root of moralistic contempt for those with AIDS, also shaped a compassionate response to the emerging epidemic. For Henry Sunpath, the vista of suffering that he witnessed while at R. K. Khan in Durban touched him deeply. The sense of Christian duty that defined his world as a physician informed the tableau he painted and drove him to ease the suffering of those with AIDS, who had nowhere to turn. People used to be coming in on stretchers from all over the outlying areas of Durban, absolutely sick, dehydrated, vomiting, hardly able to breathe. And their entire communities used to be coming along with them. ‘‘Please help this person; do something.’’ And there was no mechanism in that hospital to take these patients in, to sort them out medically, to equip them with the knowledge and the means to go back home and take care of themselves. The hospital was so overwhelmed with the numbers of these patients that, at the casualty level itself, the basic minimum was done and they were asked to go back home. It was devastating. I used to go back home and tell my wife, ‘‘I just don’t know what to do.’’ That showed me the extent to which I really needed to get involved, because it was just so hopeless, looking at the faces of those people, near death and just looking to you to do something. Jane Hampton, born in Zimbabwe, felt herself called by Christ to serve those despised by others. At home raising children during the epidemic’s first years, it was to the AIDS service that she was drawn on returning to medicine at McCord Hospital in 1997 at the age of 42. I was quite involved in the churches, telling people about the importance about accepting people who had HIV. We all need to have open hearts to people that are HIV positive. One of the stories from the Gospel that I used was, there was a woman who had committed adultery, and everyone brought her to Jesus. He said, the one of you that hasn’t sinned, throw the first stone. That is how we should accept people. Not one of us has not sinned. You have to accept people as they are and love them like that and work from there. Saul Johnson was a 30-year-old resident in 1995 when the disjunction between the realities of HIV care at Baragwanath Hospital and his expectations of pediatric medicine forced him to confront his own institution. I got a lot of satisfaction working with children. The ability to do a lot of curative medicine with children was the attraction. Of course, that changed with HIV. I come from a more activist background, so I was more inclined to challenge the status quo. There was a moral imperative that we had to do something about this disease. This was clearly the challenge—this was the challenge that we needed to face. We just got on and did it, because nobody else was doing it. Given the poverty of those who began to fall ill with AIDS-related diseases, it is not surprising that doctors in private practice initially played a relatively small role in providing leadership and generally, when consulted, offered episodic and cursory care. But as the epidemic grew, it was not restricted to the poor. It also included those with employer-sponsored medical insurance, which at first slowly and then, in 2005, as a matter of law extended coverage for AIDS-related treatment. 2 Employees covered by such plans sought medical attention in settings other than the overtaxed outpatient departments of public hospitals or the few HIV clinics that had begun to emerge. There were, for example, experienced private doctors who had developed expertise over the years by taking care of gay men. There were also those who saw in AIDS a potential source of income with a new client base. Like others concerned about the economics of private practice, Ramesh Laloo Bhoola, who had been in a private medical partnership since 1976, recalled how his initial reluctance to treat AIDS in Durban crumbled. Initially, I wasn’t well informed, so I wasn’t treating people with AIDS. But my partner in a Blackish area was seeing a lot of them. And then I felt, he’s seeing all these patients; perhaps I should also start seeing them. But initially I wasn’t keen to treat them; I was sending them away.